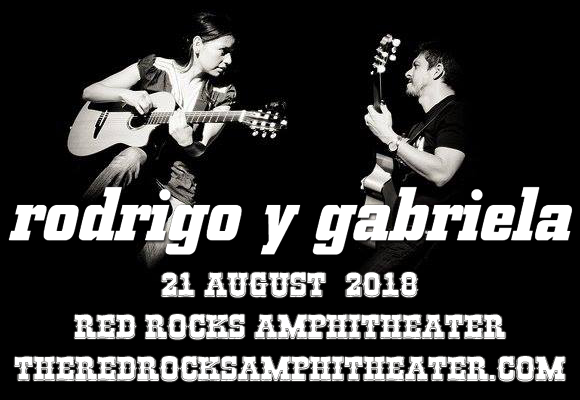 Bringing their unique metal-flavored flamenco guitar to Red Rocks Amphitheater on Tuesday 21st August 2018, critically acclaimed Mexican duo Rodrigo y Gabriela are a summer must-see! This fiery twosome are masters of their art, weaving passionate and intricate melodies throughout their breathtaking duets! An incredible and unforgettable live act! Known for their heavy metal-influenced flamenco music, Mexican classical guitar duo Rodrigo y Gabriela formed in Dublin, Ireland in 2000. Frustrated with the Mexican music scene the couple, Rodrigo Sánchez and Gabriela Quintero, had moved to Europe where they busked and performed at local bars. Their debut album, Rodrigo y Gabriela (2006), entered the Irish Albums Chart at number one and an appearance on Late Show with David Letterman brought their music to a wider audience. To date, the duo has released five studio albums, three live albums and one EP.